I had been concerned that, after all the controversy and hullabaloo surrounding my efforts to land a tete-a-tete with Jerry Lewis, the chat could never possibly live up to the chase. I also was nervous, given what so many of my fellow journalists had privately told me about Lewis’ legendary temper; that given all the sand I’d kicked up in the past week, I was in for a licking. Instead, what I got was one of the most refreshingly honest -- if unlikely and depressing -- commentaries on what Vegas is becoming that I’ve heard from the many old-timers I’ve interviewed over the years. More on that in a moment. But here’s the thumbnail on that controversy: With the Muscular Dystrophy Telethon coming up on Labor Day, I wanted to interview Jerry Lewis. I planned to do a piece for a major national magazine, write here in this column a bit and air the audio on my podcast, ”The Strip.” So I emailed his Web site and got a strange response from one Rick Saphire telling me that for an interview of broad nature, he could arrange it for “a sizeable fee.” Baffled, I asked how much. $20,000, I was told. Amazed, I asked if anyone actually pays that and was told yes but only the “heavy hitters.” I posted all of this on the blog for “The Strip” podcast and the story went national. Then an MDA spokesman called, told me that Mr. Saphire had been out of place and now is out of work with Lewis, and when did I want to meet Mr. Lewis? On Wednesday, then, I was at the South Point, home of the 42nd Telethon, where I was led through a huge room where MDA folks were getting everything ready. I sat down at a corner desk in this wide-open room and waited until, through a door nearby, Lewis himself entered on a motorized scooter bellowing silly insults at various staffers. He was in a terrific mood and spoke excitedly about the upcoming show and about how amazed he is that these events have raised so much money. Unlike my colleagues’ past experiences, he remained pleasant throughout my half-hour chat, even allowing me extra questions after deciding my time was up. No, he didn’t turn his ire -- not on me, anyway. He was too busy slamming what’s become of Las Vegas in the past couple of decades. It started out, reasonably enough, with what sounded like a platitude I’d heard a million times, the notion that things were better “when the mob ran Vegas.” I chalked it up to nostalgia until Lewis really got on a roll. Lewis: When the mob ran this town, we had Las Vegas. When the corporates came in, we have Huckleberry Finn Farms. Friess: You don’t like Vegas as it is now. Lewis: Theatrically? No. It’s a very bad Coney Island. It’s unfortunate, but that’s what it is. A bad Coney Island. It’s carnival. It’s cotton candy and hookers standing on the street. Come on! Friess: So you’re not a fan of the Cirque du Soleil shows or the Broadway shows they’ve brought here? Lewis: Those are wonderful, but you can’t polish a turd. I don’t care who you talk to, it’s impossible to polish a turd! If you have a bad idea, you think it’s going to be fine when you bring in a new architect and you make the buildings prettier? The creepy rooms are still crummy. But you put a new façade on your hotel and that’s class? Come on! Yes, folks, he was point-blank stating that the overbuilding of hotel inventory in Vegas will lead to our collapse. It’s not new, of course. As I wrote last week, Life Magazine asked if the Vegas boom was overextended back in 1955. Is he right? I tend to doubt it myself. And some of what he said about today’s Las Vegas was plain incorrect. He referred, for instance, to paying $25 for parking on the Strip, the New York-New York being up against the Luxor and the Harrah’s having a piece of it inside the Paris. Nobody pays for parking on the Strip and those two pairs of hotels aren’t even in the same blocks with one another. Just learned I'll be getting an interview with Pete Rose for one of my major clients, so that's pretty exciting. Also, don't forget, I've got a Steve Wynn chat in the can to roll out in the next few weeks. And Neil Sedaka's coming up in September as well. Today, I'm off right now with my Little Brother (from Big Brothers/Big Sisters) to try out the new Golden Nugget pool with the sharks for a travel piece I'm doing on animal acts and exhibits in Vegas. Will hopefully have some fun pix to share when I get back. Then it's off to Borders to pick up my held copy of Pete Rose's autobio, then to get a little haircut and then to go to PBS in Vegas at 6ish to appear on "Nevada Week in Review," a weekly local public affairs show. So if you're around your TV at about 7:30 p.m. tonight, watch me BS my way into chatter about some topics I'm smart on and others that I just pretend. Fun! Jerry Lewis Was Great. Really. I've just come from my much-ballyhoo'd and FREE chat with Jerry Lewis. It went quite nicely. I know he's known as a major-league jerk to many journalists I admire, but I think all of this hullabaloo put him on his very best behavior. I only got about a half-hour which is a bummer because I had a lot of questions I wanted to ask and he seemed to be enjoying the fact that I had read his book. But I got some good stuff out of it, in particular Lewis' very opinionated condemnation of modern Las Vegas. I'll link to my Las Vegas Weekly column on this on Friday and the full conversation will be aired on the SECOND ANNIVERSARY edition of "The Strip," which records live this Tuesday at 7 pm at LVRocks.Com and posts to the podcast feed on Thursday. Richardson Screws It Up -- Again. I don't usually deal with issues this off-topic on this blog, but I feel the need this time because I'm so amazed at the hamhandedness at work here. Gov. Bill Richardson will be in Vegas tomorrow. He's mixing his public appearances with an inexplicably private meeting at the Las Vegas Gay and Lesbian Community Center with a collection of handpicked gays and lesbians. This is supposed to be the event that will help him "make up" to our gays after he screwed himself earlier this month by telling Melissa Etheridge in the first-ever televised gay-issues forum that being gay is a choice. Since his campaign hinges on a decent showing in Nevada early in the process, the fact that he alienated an important Democratic voting bloc - and their friends - is of critical concern. This event actually was my idea to begin with, but it's being executed in such a pathetic manner that it actually makes the whole thing worse. The morning after that debate, I suggested something like this to both Richardson's openly gay Nevada staffer and a gay Vegas friend who was being asked by the campaign how to fix the damage. I'm not generally in the business of giving out political advice to candidates, but these friends of mine were posing the question to me of what he could possibly do to alter his tattered image with gays. I went on to write a piece in the Las Vegas Weekly this week that argued this point as well. Rather than such a grand gesture, the immediate response the day after the debate from the Richardson camp was to have the guv call up handpicked gays -- high-profile bloggers and potential donors, mostly -- to apologize to them for his debate answer. None of this did any good in terms of tackling the real problem, which was that it was the image of him looking dour and irritable amongst the gays on that TV show that made his "choice" comments hurt him so much. It was the visual that harmed him far more than the remarks. The real solution, it seemed to me, would be to put Richardson out in public in front of a diverse crowd of gays and answer their questions. He had screwed up on national TV; he can't fix it in private. If he wanted to make amends to the Vegas gays, he needed to come to them. Instead, his camp decided to choose a "special" group of gays, do it at the Center as I imagined but close it to the public. That's what's up tomorrow. I was invited to this meeting but was told I'd not be able to write about it if I attended. I didn't see the point of that, so I declined. When I asked why it was closed, among the answers I got was that some of the "participants" wanted it that way. That's just weird, bordering on a lie. Beyond the fact that they're not opening the thing up to all comers, they're saying they can't even find a group of gay people in Vegas who aren't embarrassed to be in the news? Or who aren't in politically sensitive circumstances -- declared supporters of other campaigns, I imagine -- that their presence at a coffee with Richardson would cause them discomfort? That can't be it. Obviously, they don't trust their own candidate not to step in it again in public with the gays. That's why he only talks to special gays in special circumstances. I've heard the argument, too, that the campaign wants it closed so those present "feel free to speak their minds." Open it to the public and be assured some who show up will feel completely comfortable "speaking their minds." I was also told that the governor wants this to be a "conversation." Huh? This isn't the queer re-education of Bill Richardson. He's not like George W. Bush in 2000, when the Texas guv met with the Log Cabin Republicans in private and listened for his first time to gay sob stories. Richardson already "gets it" with the gays. He knows many. His record shows he's the furthest thing from a homophobe and, intellectually, his uncertainty as to whether being gay is a choice is, if more eloquently delivered, the true answer. Science hasn't determined that yet. I believe it from my own experience, but is there an irrefutable body of evidence? No. This is my political analysis: If this campaign really wants to make an honest attempt to repair this damage, they'll have to take a risk. They have to put this man who believes he should be president of the United States out there in public with the gays he offended and show everyone he can take the heat and is earnest about his contrition. If he does that well, he gets a photo op that may help erase the image of himself looking unhappy and crabby at the TV forum, not to mention he helps bring some attention to a Vegas gay center so underfunded that KNPR's Dave Berns asked me on the air last week whether it was a secret that it exists. If Richardson can't do that, he has no business being president anyway. "The Strip" is LIVE @ 7 p.m. w/Macy Gray + Lynn Johnston! We're sticking to our original plan of having the live show TONIGHT with singer Macy Gray and an excerpt of my long, great chat with "For Better or For Worse" cartoonist Lynn Johnston. Also, more on the Jerry Lewis thing, the New Frontier implosion, the Amazing Johnathan slur non-controversy and the latest shooting on the Strip. Join us @ 7:05 p.m. PT at LVRocks.Com in the chat and have a drink handy on the not-so-off chance Miles lets out a cuss. Or grab the show when it posts on Thursday here. Macy's concert in Vegas is this coming weekend so her interview can't hold. The full Johnston interview will post as Strip Extra within the week, so keep watch for that. The cartoonist is radically altering her format as of Sept. 3. And next week, God willing, we'll have Jerry Lewis for our 2nd anniversary show! Plus, a medley of outtakes I've been collecting. Don't forget to subscribe to the show on iTunes. Miss a week, miss a lot. And now I'm off to try some sort of yoga that involves a 105-degree room and a lot of sweat. Eek. E-mail me or post your questions here. Let me know what you want to know. We'll probably tape "The Strip" on Wednesday this week instead of Tuesday to fit this in. I was told that Jerry is NOT angry with me. Mr. Saphire is another matter. I received a call today from a spokesman for the Muscular Dystrophy Association who read today's item about this blog in Norm Clarke's Review-Journal column. This blog's posting yesterday made it's way onto The Huffington Post and the popular Romenesko journalism blog as well. The spokesman told me that Mr. Lewis is quite appalled by the actions of Mr. Saphire and has severed ties with him. Indeed, yesterday, Saphire's site touted Lewis as a lifelong friend and had a drawing of Lewis as its main art (as seen in this screen shot). Today, the Jerry Lewis link is dead and the only Lewis listed in a blurb about his clients was Mally, daughter of the late Lambchop puppeteer Shari. The $20K fee was actually something Lewis set up a few years ago for international media because he was trying to shrink down the number of interview requests he receives. It was never intended to be suggested to mainstream American journalists. I'm not sure this explanation fully makes it that much better -- a polite "no" seems more honest and less likely to create this sort of negative feedback than an unrealistic, ridiculous fee -- but I was pleased to get any answer of this type. That said, the MDA spokesman said Jerry Lewis will sit down with me for an interview after all. And, no, it won't be limited to chat about the MDA and the Telethon, although I do want to hear about that. So stay tuned. If it works out in the next day or two, Lewis will be this week's guest for "The Strip." I only hope the chat turns out to be as least as interesting than the chase. I interviewed Steve Wynn last week for a few of my publications. But this piece of news has no such home and could be scooped soon, so I blog it. The owners of the property stay across the street at Wynn Las Vegas when they're in town, and they tell him stuff. And Wynn volunteered to me that the implosion will be October 13. I'm glad I checked around, though. Wynn is slightly mistaken. I can now tell you without hesitation that Wynn was off by a month. 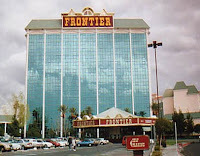 The Frontier is scheduled to disappear on November 13, not October 13. Aside from the unimpeachable nature of the sources who clarified the date for me, there are other reasons why Nov. 13 rings true. For one, Oct. 13 is a Saturday, and there's no way Clark County would allow that. But Nov. 13 is a Tuesday, the same day of the week as the Stardust implosion. And I remember when working on the Stardust implosion that county officials had said they demand implosions take place early Tuesday mornings because that's the lightest traffic time of the whole week on the Strip. No word yet whether the implosion will be turned into a spectacle, although Phil Grucci, the owner of the fireworks company that handles all the big shows, has been contacted and discussions are underway. Grucci, for the record, is among the sources who confirmed the date for me and said he had not heard of a specific date as yet. I'm starting to think so, at least where black activists are concerned. We've been deluged by emails from "The Strip" listeners and blog readers outraged by the easy use of the ultimate slur of black people (five times) and women (twice) made by longtime Vegas headliner and Comedy Central star The Amazing Johnathan on Aug. 9 on "The Strip. Since that show aired, Norm Clarke in the Review-Journal did a major item on it on opening day of the National Association of Black Journalists convention here in Vegas. The NABJ was the leading activist group attacking Don Imus earlier this year. But Clarke says he got nary a returned call or email from anyone at the NABJ. Nor did the NAACP or any feminist groups take any public notice. Hear a 3-minute clip of the remarks here. Is it that Amazing Johnathan's not a big enough star? That would be an odd way to decide what to be offended by -- and give an awful lot of license to an awful lot of people to use the word willy-nilly. Is it that there's no video, a la the Michael Richards thing? That could be, but the odd thing here is that Richards used the words in anger in a momentary loss of control; Johnathan essentially defined what he believes a "n-----" to be in a way that offers real insight into his thought process. Or, perhaps, the NAACP, having "buried" the N-word recently, is over it. To refresh, Amazing Johnathan defended Richards' use of the n-word by saying: "Anything you do, if you're heckling a comic and interrupting a show, you're a n---- at that point, you know what I mean, in my eyes. You're not an audience member, you're not a friend, you are the worst possible scenario. You're disrupting my job, so you're a n----. I wouldn't yell that word out and tell them that, I would have handled it a little bit more differently. If I did use that word, it would've been funny. I mean, I've called women in the audience c---s and I've gotten away with it because they were c---s but I did it right. There is a way to do it right." I guess Amazing Johnathan's right. 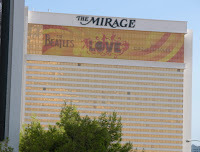 I thought it was an optical illusion -- a mirage, as it were -- a few days ago when I saw the folks up high working on the "Love" wrap on the Mirage. It seemed like it was getting bigger but, no, surely they were just finishing up its removal. Jerry Lewis Charges $20,000 For An Interview?!?!? With the annual Jerry Lewis MDA Labor Day Telethon in Vegas next month, I wanted to interview Lewis. I figured I'd do a Q-and-A for Newsweek, use some of it for my Las Vegas Weekly column and play the audio on our celeb-interview podcast "The Strip." That's weird, thought I. Also, manna from blogger heaven. So I wrote back and asked: "If the MDA helps me set up an interview, will it be restricted only to MDA and the telethon or will I be able to ask other questions? And, also, how much is the fee for an interview otherwise?" I was floored. And morbidly fascinated. I had to press on. "That's awfully steep," I wrote Mr. Saphire. "Have many media outlets actually paid that? Or do you negotiate?" Eleven minutes later, Saphire replied: "Jerry Lewis' price is his price. It's a healthy sum, but ANY story about him receives international attention and raises readership. Yes, he is often paid that much and more for his interviews, but obviously it's only the heavy hitters in the media which can afford the fee." So here's the thing. I write for the "heavy hitters." There isn't a single one that would pay for any celebrity interview, let alone one with a faded star who, while surely a fascinating conversation, wouldn't exactly move the needle on circulation or viewership in any meaningful way. And $20,000 is just off-the-wall even if it was one of the tabloids that do pay for certain interviews. We took a look-see at Rick Saphire's site, by the by, and we wonder what he charges for access to such luminaries as Mally Lewis (daughter of Shari), "The Colbys" star Maxwell Caulfield or Jerry Mathers. And I wonder how we got last summer's bizarro interview with Chubby Checker, also listed on the site, for "The Strip" without having to mortgage the house.